Toys R Us have a great offer on at the moment that gives double savings on certain My Little Pony toys so there are some huge bargains to be had here. 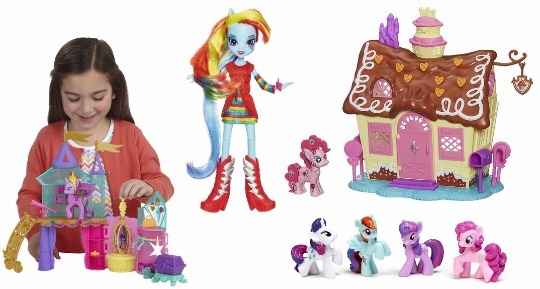 They have a Buy One Get One Half Price offer on My Little Pony products, but some of those are already reduced by up to 50% and both promotions work at the same time! As an example there are quite a few of the Equestria Girls dolls down to £9.99 from £19.99, but add two of them to your basket and the total drops to just £14.99! Not at all bad! All the products in this Buy One Get One Half Price offer are on the link above, but it's the reduced items that give you the biggest savings, like the Equestria Rocks Dolls at £9.99, the My Little Pony Crystal Playset* is also 50% off at £9.99, or the 4 pack of Mini Figure My Little Pony* is half price at £4.99. As well as those and more reduced items the Buy One Get One Half Price offer includes some of the larger multipack sets of dolls and castle playsets, so you can make some great savings here. Most of the items are still in stock for both home delivery and to buy in stores. You can also click and collect for free if you have a Toys R Us store nearby, home delivery is free when you spend over £29.99, otherwise there's that hefty £4.95 delivery charge to add on. This Buy One Get One Half Price on My Little Pony finishes on 20th October and is subject to availability.